Local lore holds that the hedge maze at Villa Pisani is so challenging, Napoleon was lost in it when he lived in the villa, and Hitler and Mussolini were too chicken to go into it at all. The maze is a classic medieval circular path with nine concentric repeating patterns and many dead ends surrounding a small tower in the center. It was designed by Girolamo Frigimelica for the Venetian Doge Alvise Pisani in 1720 as part of the beautifully landscaped grounds which surround the 114 room villa which was to be built 15 years later. The challenge comes from the hedges, which are so high that it is impossible to see over once you have entered. A statue of Minerva, goddess of wisdom and arts, holds court from the top of the central tower reached via a double spiral staircase. Pisani was a wealthy landowner with several estates in the area. He became the 114th Doge of nearby Venice in 1735, possibly the inspiration for the 114 rooms in the villa. He served for only six years before his death in 1741, ruling during the declining, hedonistic days of the Venetian Republic. There would be only six more Doges before it fell in 1797. 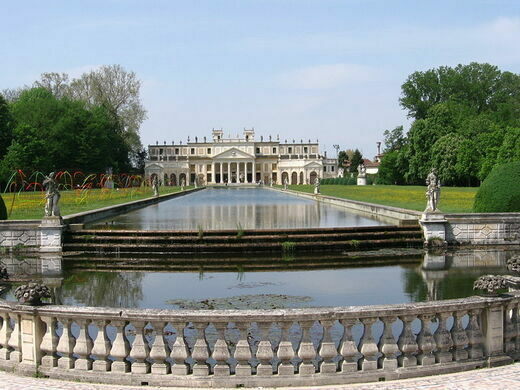 Villa Pisani is an elaborate property by any comparison. 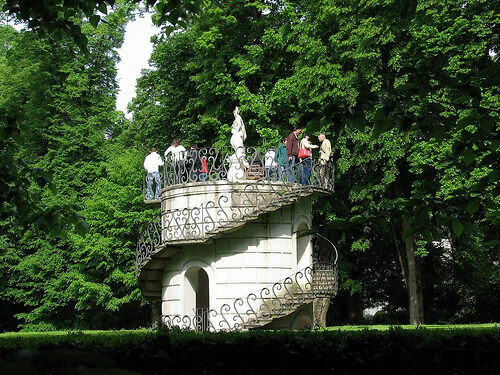 Building began in 1735 in Baroque style, with its huge rectangular house surrounded by 30 acres of gardens dotted with follies, a Versailles-like reflecting pool, a petite hill-top ice house, a miniature forest, an orangery, and false hills, not to mention the labyrinth. Inside, the walls are painted with allegorical murals of cavorting Greek gods and celebrations of thePisani family, as well as trompe l’œil effects on ceilings and walls. It was seized by Napoleon in 1807 following his conquest of Venice, and given to his stepson Eugene Beauharnais (at which time the emperor may or may not have gotten lost in the labyrinth), and was later used by Hitler and Mussolini for talks in 1934. The villa is now empty, but open to visitors. From Padua take the SITA bus to Stra terminal, or ACTV bus #53 from Venice or Padua. The villa is a five minute walk from the terminal.